Getting infested by head lice, commonly known as nits, happens to almost everybody at some point in life. It's a particular hazard for school-age children and their parents but can happen to anyone whose hair comes in contact with seats used by other members of the public, for instance in trains or cinemas. If you don't like the idea of chemical treatments, what can you do to get rid of nits the natural way? In order to tackle nit infestations successfully, it's important to understand the life cycle of these tiny creatures. Lice reproduce sexually, which means that they need to be able to find each other in order to multiply, but a single female louse can lay almost a hundred eggs in her lifetime. Newly hatched lice take eight to ten days to mature to the point where they can start laying eggs themselves. Most treatments for this problem kill the adult lice but are not able to affect the eggs. This means that repeated treatments are necessary, aimed at catching the lice after they have hatched but before they're ready to lay. The first and most important line of defence against nits is to comb. Sometimes this can be enough by itself, but usually it will be necessary to use it in combination with another method. It's most effective in short hair and should be confined with a manual search for adult lice and their eggs. It's best to do it every three days for a period of three weeks, combing when the hair is wet. Keep going several times after you stop seeing lice or eggs, to make sure. Because head louse eggs and juveniles are very small, an ordinary comb will not usually catch them. You'll need to use a special fine-toothed metal comb designed for the purpose. It usually helps to comb with an ordinary comb first, to loosen up the hair before applying the fine comb. Before modern treatments were developed, the traditional way of dealing with nits was to use oils. This approach requires patience and needs to be done in combination with a lot of combing, but it can be effective, so it is still used by many people today. Like other insects, head lice breathe through small openings called spiracles. These lead to a network of internal tubes for oxygen distribution. Oil can clog up these holes and tubes so that the lice suffocate. 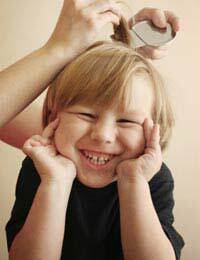 The most effective oils to use in treating head lice are olive oil and tea tree oil. Both occasionally cause allergies, so do a patch test by putting a bit of the oil on the skin of your arm before you use it to cover your whole head. Tea tree oil should never be used neat, but adding a few drops to olive oil can make it more effective. In order to work, oil treatments need to be rubbed thoroughly into the hair and scalp and left for about twenty minutes before being washed off. You should note that repeated oil treatments can sometimes boost populations of fungus on your scalp, so watch out for subsequent dandruff infections - these are easy to deal with if treated quickly. Whilst it's relatively easy, if laborious, to remove adult lice from hair, removing the eggs is very difficult. This is because they are glued to the hair shafts. The best way to remove them with minimal damage to the hair is by sliding each one individually along the hair shaft. Using a vinegar rinse on your hair will loosen the glue that holds the eggs in place. It's a useful way to follow up treatments designed to eradicate adult lice as it will reduce the number of new hatchlings, meaning you have fewer to tackle next time around. No matter what treatments you use, getting rid of head lice can be a long, slow process. Bear with it and remember that sticking to your plan, following the louse's life cycle, is the only way to guarantee getting rid of the problem.